← News flash on Dr. Kruse! 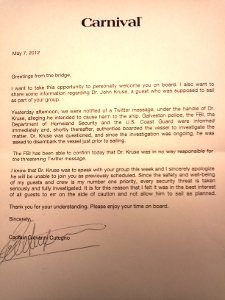 Note from Georgene: The full text of the Captain’s message concerning the “threat” surrounding Dr. Kruse was provided to us today. This is the official announcement, word for word. 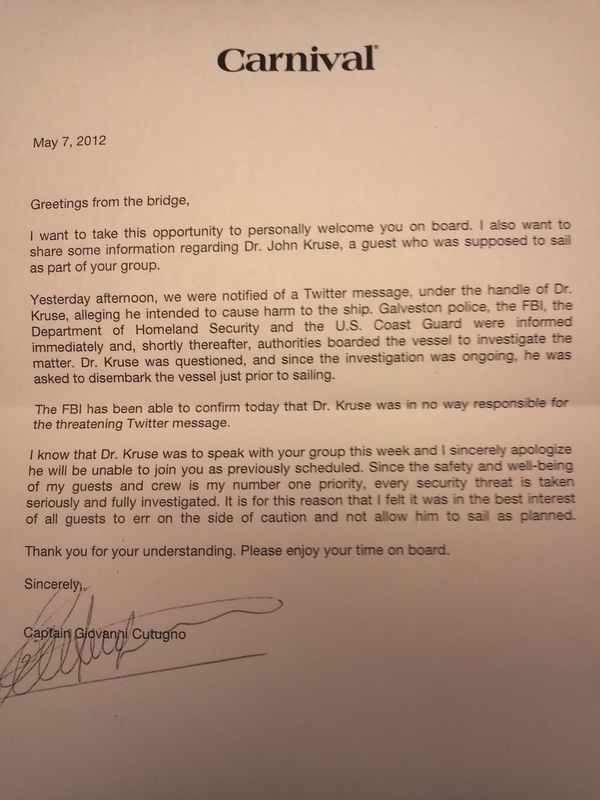 Yesterday afternoon, we were notified of a Twitter message, under the handle of Dr. Kruse, alleging he intended to cause harm to the ship. Galveston police, the FBI, the Department of Homeland Security, and the U.S. Coast Guard were informed immediately and, shortly thereafter, authorities boarded the vessel to investigate the matter. Dr. Kruse was questioned, and since the investigation was ongoing, he was asked to disembark the vessel just prior to sailing. The FBI has been able to confirm today that Dr. Kruse was in no way responsible for the threatening Twitter message. I know that Dr. Kruse was to speak with your group this week and I sincerely apologize he will be unable to join you as previously scheduled. Since the safety and well-being of my guests and crew is my number one priority, every security threat is taken seriously and fully investigated. It is for this reason that I elt it was in the best interest of all guests to err on the side of caution and not allow him to sail as planned. Thank you for your understanding. Please enjoy your time on board. This entry was posted in Diet, Fitness, Low Carb Cruising! and tagged Dr. Kruse, Jack Kruse, JohnKruse. Bookmark the permalink.